Toilet, Septic Tank, French Drain and Pit Toilet Treatment Kleen Loo Dosage Treatment that eats faeces, organic matter, fats, oils and greases. Liquid bacteria to dose your toilet to break down faeces, organic matter Fats, Oils and Greases. 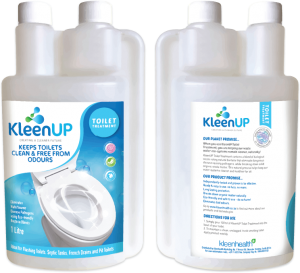 kleenUP Toilet Treatment breaks down foul odours within 24 hours, waterborne diseases, Fats, Oils and Greases to avoid build up or blocking. Treating the toilet regularly creates a healthier environment. Helps create a hygienic toilet. Reduces the build-up that causes offensive odours at their source. Liquid bacteria applied down the sources to the toilet. Chemicals and Boiling Hot water is harmful to the bacteria’s. Elimin-8 Elimin-8 has been specially formulated to be first time effective because it is a residual anti microbial and is attaches itself to the source of the odour and kills it completely, it is neither a pairing agent nor a masking agent. Used by carpet and upholstery cleaners to treat odours and bacteria relating to urine of human including bedwetting and incontinence, it removes mal odours and works extremely effectively, lasting a long, long time. Removes germs that cause the odours, moulds and spores. Treat the affected environment to provide protection against bacteria and microbes that can trigger asthma and allergies. Enjoy an odour free environment Protect your bathrooms. Fresh smelling toilet, beds, carpets all year round. Controls the proliferation of bacteria Reduces odours and smells created by bacteria Incontinence. Perspiration odours. Remove Vomit odours. Removes Faeces odours. Spray onto surface – Not an Air Freshener Use on the seats (not leather), the carpet and roof fining. Turn on the air-con system to recycle mode, spray the areas listed above., close the cabin and run the air-con for 15 minutes with windows closed and no humans or pets inside. Air by opening doors and windows. For use in you car, home- fabrics, upholstery, drapes, etc.